I’m no boxing fan, thus I haven’t followed any Pacquiao fights – a duty expected from a Filipino. But I greatly admire his passion for his craft, and his hardwork on it, which, unfortunately, is rarely shown on TV. Aside from boxing, Manny Pacquiao is also known for his showbiz career — acting and singing, his cockfighting “hobby,” his political career, and now he’s being a preacher. But little is known about his running, probably except to his die-hard fanatics (On the other thought, I think 99% of Philippine population are die-hard fanatics.). I learned about Manny’s running when he trained in Cebu, and local newspaper featured him running in one of the subdivisions in Cebu. I was not into running back then, but I thought it was COOL. With his recent loss, the best way to cope with it is to move forward just like in running. I don’t meant for him to retire from boxing, but I just wonder what if he pursues a career in running or multi-sports. Following are pictures of Manny Pacquiao running, which I gathered from all over the world wide web. 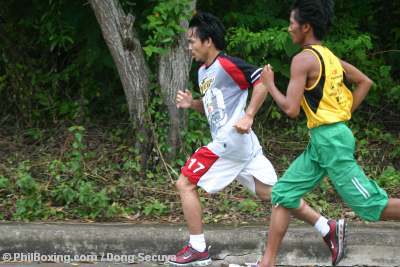 Starting with this picture of him and Adonis Singson, one of Cebu’s elite runners, running at Alta Vista in Pardo. The philboxing article said that Manny Pacquiao ran at this time 10KM in 40 minutes, with a 3KM non-stop uphill. It looks like Manny is fond of running uphills. “No one can keep up with Manny on those hills, but I can. I push Manny past his comfort zone and he knows it.” Brian calls himself a “pacer” he is there to pace Manny and truly pushes him. via Manny Pacquiao | Gevrina Seferaj’s Personal Blog. It was definitely a sight to behold. To think this was only part of Pacquiao’s training. He starts his morning early and runs up the hills for hours without break overcoming the thin air and the rugged terrain. None of his sparring partners were able to keep up. What I saw was boxing’s biggest star training as if he was a motivated kid just trying to make it in his sport. via How Manny Pacquiao defied the odds: The blueprint to success of boxing’s best – National Filipino Sports | Examiner.com. via World Boxing News: WBN Photo: Manny Pacquiao Griffin Park run. via Special Report: THE RING tracks down Pacquiao as he begins training | RingTV. 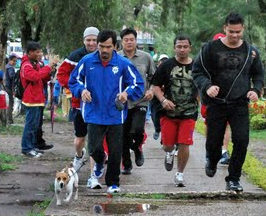 Manny Pacquiao also seems to be fond running with a dog. via Any Given Sunday: Manny Pacquiao, the Runner?. Ex-WBO welterweight champion and widely recongised as one of the best pound for pound fighters in history Manny Pacquiao has paid credit to his four-legged training partner for his incredible fitness. The Filipino fighter has cited his dog, Pacman, as his most prized conditioning coach. 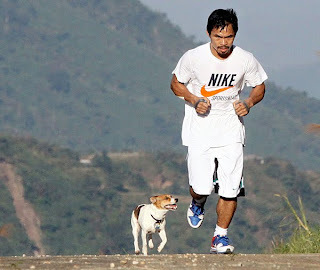 via Boxing Legend Manny Pacquiao Hails Canine Training Partner. Manny Pacquiao seems to be fond of big headphones during his run. it looks like Beats headphones? via Manny Pacquiao Photos » PAC-MAN Photos» Official Pacquiao Website. Manny also joined a fun run. via Linking Arms for the Pasig River | Demotix.com. And, Manny Pacquiao seems to have a beautiful running form. Manny Pacquiao running Photo Gallery | Boxing News – Boxing, UFC and MMA News, Fight Results, Schedule, Rankings, Videos and More. via Ricky Hatton v Manny Pacquiao: big fight countdown – Telegraph. via Manny Pacquiao running photo gallery | Boxing News – Boxing, UFC and MMA News, Fight Results, Schedule, Rankings, Videos and More. Manny Pacquiao for ironman? Why not! Following is a Manny look-alike. 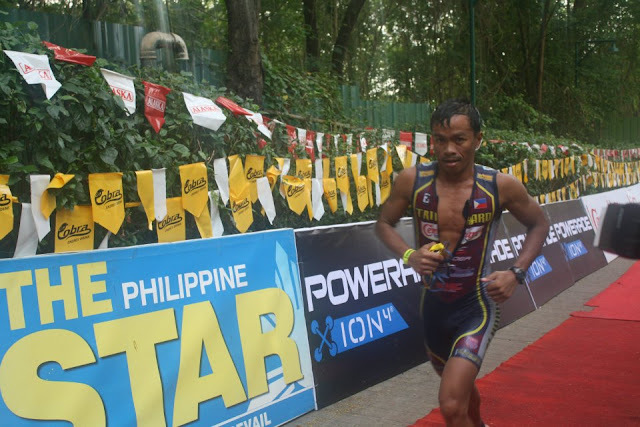 via Snapshots from Ironman Cebu Triathlon [Contributed Photos] | Cebu Market Blog. If Manny will be joining a run or tri-sport, that might be the time I will follow every fight of him!